Three tools have been developed at Process Research Solutions for routine water quality monitoring and the control and improvement of water quality and water system operations. Outside of the Process Research Solutions water quality investigations for municipal water utilities and for private building owners, many small and large municipal drinking water systems have used the three tools of proactive water quality control for one or more 1-or more-year monitoring periods since 2006. The water systems are shown on the map below. Determined the significance of chemical scales and microbiological activity in the elevation of lead, copper, and iron in drinking water. Demonstrated that cleaning accumulations of chemical scales and biofilms from pipe walls AND achieving biostability of the water lowers lead and copper release. Demonstrated the ineffectiveness of products that contain polyphosphate in lowering lead and copper concentrations in drinking water. Demonstrated that orthophosphate can be ineffective as a corrosion control agent when existing chemical scales interfere. Identified the patterns of nitrification in the drinking water throughout the year affecting several water quality parameters including dissolved and particulate lead and copper release. Implicated corroded unlined cast iron water main in elevating lead concentrations by means of releasing iron particulates that adsorb and transport lead after contact with lead surfaces. Demonstrated that the three tools are effective in achieving simultaneous compliance when changing system parameters to comply with one regulation while assuring that the system stays in compliance with the Lead and Copper Rule. In one case, disinfection was changed from free chlorine to chloramine while not only staying in compliance with the Lead and Copper Rule but also lowering the lead and copper levels. 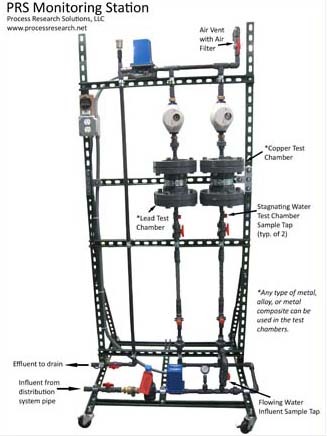 Another water system documented that there were no deleterious side-effects on lead and copper release after installing an air-stripper to remove VOCs from the water. However, the data showed how the air-stripper caused excessive precipitation of calcium carbonate in the water system. Determined the effectiveness of a new water treatment system. One water system changed the pH and alkalinity of the water to control lead and copper. The monitoring tools showed that the parameter changes did not reach into the distribution system and that the lead and copper levels were actually influenced most by iron particulates and microbiological activity coming from corroded cast iron water mains. Implicated chloride as a major factor in solubilizing copper and lead. The data from several systems have emphasized that chloride in many wells around the country is increasing because of road salt and copper, especially, can increase in the water system because of it. Implicated sulfate as a major factor in solubilizing copper and lead. 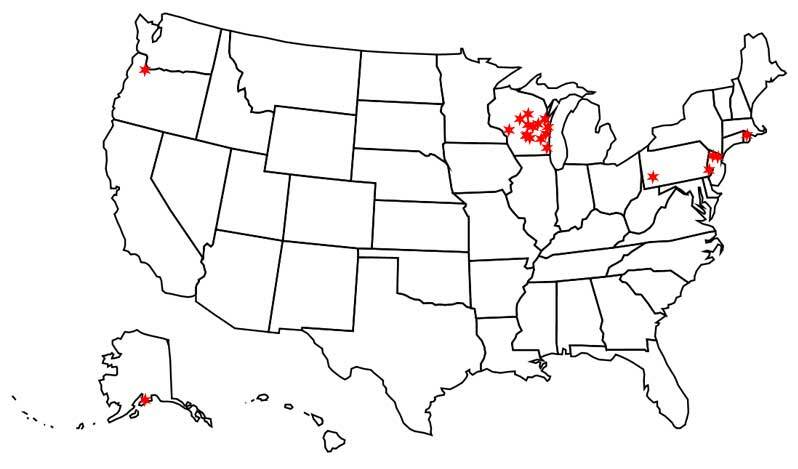 In one system, data indicated that sulfate entered the well by means of glacial sediments carried by precipitation. The sulfate in the sediments solubilized copper when the water was in contact with copper surfaces. The tools of monitoring also identified that structural issues must be occurring at the wells in order to allow an influent of precipitation and sediment into the well water and ultimately the distribution system water. 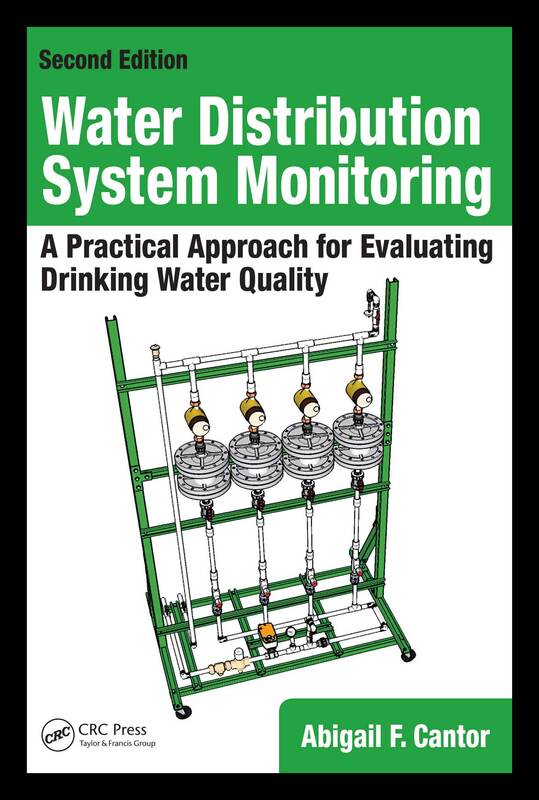 Demonstrated that remedial steps to improving water quality can be monitored with these tools to determine the effectiveness of the remediation efforts and aid in decision-making in further efforts. Demonstrated that once a system is in control of its water quality, further improvements can continue to be made to take water quality and system operation to even higher levels. It has been observed in Process Research Solutions projects that there are three categories of factors that shape water quality. All must be addressed in water quality control. Monitoring data must be representative of the water quality that the consumers are experiencing. The PRS Monitoring Station, a license-free standardized water distribution system monitoring station, is an economical and convenient surrogate for residential sampling. 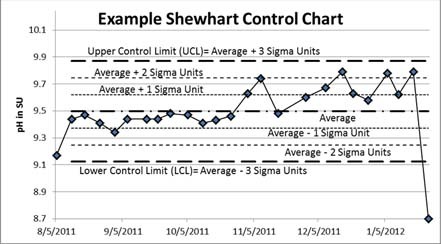 The Shewhart control chart, the same chart used for industrial quality control and improvement, is a powerful tool for any water system data. It allows for quick and meaningful data analysis and indicates when a parameter is beginning to change - for better or for worse.